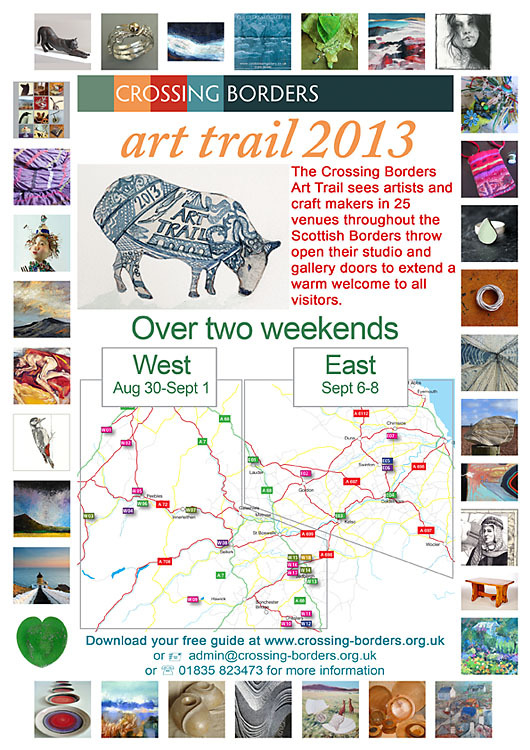 The Crossing Borders annual open studio event, the Art Trail, is nearly upon us! Split over two weekends to allow visitors to explore a large area, artists across the borders will fling open their doors for you to come and see their work, chat, get involved and have a good day out! If you haven't picked up your guide yet you can download a digital copy and pick up a paper copy at your first venue. Rich and I will both be at Allanbank Arts with Gill Walton, Hannah Longmuir and Richard Oldale on the 6th, 7th and 8th of September. The venue will be open 10am to 5pm each day and I am running a morning 10am-12pm and afternoon 2pm-4pm drop in workshop each day. For just £5, to cover the cost of materials, you can try your hand at wire wrapping your beach finds to create a necklace or earrings. It takes about half an hour to create a piece of jewellery and you are welcome to drop in for a workshop between 10am and 2pm or 2pm to 4pm. I have arranged it into two sessions after finding that I didn't get much chance to talk to other visitors when I ran workshops all day, not to mention failing to eat lunch or go for a wee! Having gone on the trail as a visitor and participated as an artist last year I can highly recommend an arty jaunt around the borders! Do take a few minutes to plan your route, look out for the artists you are particularly interested in meeting or find out where you can do workshops. All the information is in the guide, including contact details for each artist if you need to ask anything beforehand.